Like Robert Edmondson, Klein is another American hero flushed down the memory hole for defying the Rothschild -Rockefeller cartel. 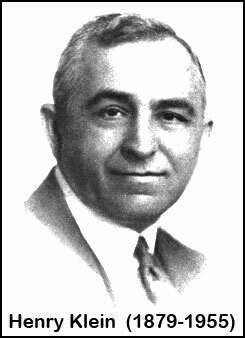 There is no Wikipedia entry for this Jew who fought the Masonic bankers all his life as a crusading NYC reporter, editor, author, city official and Mayoral candidate. (He said the Rockefellers and most other tycoons are under Zionist control.) He became a lawyer and defended pro bono Christian patriots in the famous "Sedition" Show Trial of 1942-1944. Klein represents the true Jewish spirit, not exclusive to Jews, of serving God, the inborn universal principle of absolute truth and justice. Like other groups, Jews have been betrayed by the Luciferian (Illuminati) central bankers using various 'isms including Zionism, Communism, Liberalism, Fascism, Socialism and Feminism. Klein dedicated his 1935 autobiography "My Last Fifty Years" to his mother "whose Instincts and Spirit were transmitted to her son." He can truthfully say, "In a world ruled by Mammon, I have tried to serve my Fellowman...If I have exposed some hypocrites, humbugs and liars, I feel I have only further served God." Klein's criticism of Zionism was confirmed last week when Barack Obama proved that even a Black man can become President if he is prepared to do Zionist dirty work. His first act was to appoint Rahm Emanuel, an Israeli dual citizen, as his Chief of Staff. This is fitting since Obama's own citizenship is in doubt. The height-challenged Emanuel is rumored to be Mossad. Sit back and enjoy Barama's black-faced imitation of JFK while he executes the Illuminati agenda inflicting more war and hardship on the US people. If he has any qualms, the bankers will remind him that Larry Sinclair's number is on their speed dial. To digress from Klein's story for another moment, there is a revealing item in the Jerusalem Post about how Rahm Emanuel called his rabbi on Rosh Hashanah to ask if he could violate the holiday for a conference call about the $700 billion bank bailout. Rabbi Asher Lopatin gave his permission "as long as the violation was kept to a minimum" since "this was a matter of life and death" and "modern Orthodoxy" is committed "committed to making it a better world." Jewish author Arthur Koestler said Judaism "teaches Jews how to cheat God." The rabbi justifies violating religious law to bail out bankers and calls it "making it a better world." This self deceit is a reminder that Jewish rabbis are merely "scholars" and not holy men in the sense of renouncing the world. The election of Barack Obama will polarize Liberal and Conservative. We will see the typical Zionist Communist practice of censoring information, dissent and free speech in the name of curbing "bigotry" and anti-Semitism. In 1942-44, FDR ordered a Stalinist Show Trial to punish American patriots and anti-Communists. Since Russia was an ally, he wanted to paint his critics as Nazis and anti-Semites. About 45 disparate activists, including Robert Edmondson, were charged with inciting rebellion among American soldiers and put in jail. The investigation against them was conducted by the B'nai Brith, the FBI and reporters for the (Illuminati Jewish banker owned) Washington Post. Henry Klein represented Elmer J. Garner of Wichita, Kansas, the first cousin of FDR's first Vice President John Nance Garner, a deaf 83-year-old American patriot who died three weeks after the trial began. He had been held in the [Washington, D.C.] jail for several weeks, for lack of bond fees, and died alone in a Washington rooming house with 40 cents in his pocket. Among the other persecuted patriots were: a sign painter who was 80 percent deaf, a Detroit factory worker, a waiter and a maid. (This account is indebted to "A Mockery of Justice - The Great Sedition Trial of 1944" by Michael Collins Piper & Ken Hoop. More prominent targets included former American diplomat and economist Lawrence Dennis, who said "Pearl Harbor did not suspend the Bill of Rights"; Mrs. Elizabeth Dilling of Chicago, an outspoken and articulate anti-Communist lecturer; Rev. Gerald Winrod of Kansas who had run for the Senate; and William Griffin, a New York-based publisher with connections in the Roman Catholic Church. After Garner died, Klein represented Col. Eugene N. Sanctuary,73, who ran the Presbyterian foreign mission office in NYC. Sanctuary had written a pamphlet "Is the New Deal Communist?" in which he made a 35-point comparison of it to Marx's 1848 program. He also wrote "The Talmud Unmasked: The Secret Rabbinical Teachings Concerning Christians" (New York, 1939). He was also the author of several hundred sacred and patriotic songs including "Uncle Sam We Are Standing by You." He was hardly the dangerous seditionist that the prosecution and the sympathetic press painted him to be. "This alleged indictment," Klein said in his opening address to the jury, "is ... under a Constitution which guarantees free press and free speech at all times, including during wartime...These people believed in the guarantees set forth in the Constitution, and they criticized various acts of the administration." "We will prove that the Communists control not only our government but our politics, our labor organizations, our agriculture, our mines, our industries, our war plants and our armed encampments." "We will prove that this persecution was instigated by so-called professional Jews who make a business of preying on other Jews by scaring them into the belief that their lives and their property are in danger through threatened pogroms in the United States [and that] anti-Semitism charged in this so-called indictment, is a racket, that is being run by racketeers for graft purposes." "We will show that the most vicious written attack on Jews and on the Roosevelt administration emanated from the office of the FBI by one of its agents, and that the purpose of this attack was to provoke others to do likewise. We will show that this agent also drilled his underlings in New York with broom sticks preparatory to "killing Jews." Klein's speech was a critical turning point in the defense Lawrence Reilly wrote that "Klein did much in his brief speech to torpedo [Prosecutor] Rogge's case by bringing to light the hidden agencies responsible for its existence." As a direct consequence of his offensive against the ADL and the other Jewish groups that had orchestrated the trial, Klein was targeted, specifically because he was Jewish. Klein wrote that "attempts were made to poison me in in Washington DC and to knock me off otherwise in NYC. My telephone has been tapped for more than 10 years and my mail stolen. Clients and friends were warned to keep away from me and word was sent out by the Jewish cabal to starve Klein." According to Revilo Oliver, Klein committed suicide in 1955 but it is quite likely he was murdered. Louis McFadden, the chairman of the House Banking Committee was similarly murdered in 1936. The author of the "Protocols of the Elders of Zion" boasts of killing opponents, especially uncooperative fellow Masons, and making the deaths look natural. We live in a society which is like a snake shedding its skin. The old skin was Western civilization, devotion to God, country, human development and freedom. The new skin is a banker-controlled, socially engineered plantation where the slaves think they are free. Henry Klein sacrificed his life to preserve his country and its values but America doesn't even know he existed. This is the fate of patriots in a land which has been totally subverted by an international satanic cult bent on translating its economic monopoly into a total monopoly over politics, culture and religion. Zionism, including organized Jewry, is an unwitting accomplice in this demonic drive to control and own everything and everyone. But Zionism is just one arrow in the Illuminati quiver, which includes Freemasonry, most religions including fundamentalist Islam (Salafis/Wahabis,) Intelligence agencies, corporations, governments, foundations, think tanks, the mass media, education, NGO's etc. Essentially they have control over money and everyone dances to their tune, while oozing unction. They pit their various agents against each other in order to achieve their goal, the degradation and enslavement of mankind. It's hard to say whether the Illuminati expresses a Pharisee Jewish need to control the world, or a Satanic one, or whether there is a difference between the two. But one thing is clear. Like everyone else, Jews like Henry Klein have an innate connection to God. Once we realize we are victims of a monstrous hoax, we can follow Klein's example and express His Spirit anew.